No methods that destroy the water structure or change its biological activity may be used for wastewater treatment. The parameters of cleared sewage should be close to the natural water. Actually this was the purpose of the BIOTAL technology creation, because after such treatment the water can be used again, which helps to save drinking water, the cost of which is more and more expensive each day because of the pollution of its sources by uncleared sewage. When developing the BIOTAL technology, the advantages and disadvantages of the continuum and discontinuum systems were taken into account, as well as to solve the emerging issues, new hydro-pneumatic devices were created: siphon airlift, controlled siphon, reverse airlift. All of the above-mentioned devices are patented and are very reliable, since they do not have moving parts in their design, and therefore there is nothing to be broken. The control of these devices is made via electromagnetic valves connected to the control unit. The water levels in BIOTAL plants are monitored by water level sensors connected to the control unit, which automatically adjusts the operation of the plant, depending on the wastewater discharge. Electromagnetic valves MIVALT (Czech Republic) have a large resource, which is measured by millions of switching-on/off cycles, which is the decades for BIOTAL plant service life. BIOTAL plant automation is assembled from the factory modules of the world’s leading manufacturers – Mitsubishi, Siemens, Eaton, ABB and others. Even on the smallest BIOTAL plants, an automation is installed from the factory units of the indicated companies, equipped with a monitor, which shows the basic parameters of the plant. Control units can be connected to the Internet via a modem and the necessary information can be readremotely. BIOTAL technology is a fully automated, 7-step, 3-sludged, self-directed hydro-pneumatic and biological system with four-circuit backflow recycle of active sludge. The need to create such a system was dictated by the fact that for effective biological treatment of the ratio of organic matter, nitrogen and phosphorus in wastewater coming to the purification, should be in the proportion of 100: 5: 1, which never happens in real life. Therefore, bacteria of active sludge in such conditions purify sewage from organic contaminants not completely. Multi-circuit recirculation and multi-stage system solve this problem, because when the sludge returns to the first reactor, where wastewater comes, there is denitrification of sewage, which helps to reduce the concentration of organic contaminants at the outlet of the plant. In the BIOTAL plants, conditions are created for the simultaneous removal of nitrogen and phosphorus by biological means. For this, alternation of the anoxide and oxide conditions is ensured at the age of the active sludge for more than 25 days. In this case, there are developing facultative microorganisms that take an active part in the purification processes, both in oxygen and in oxygen-free conditions. This increases the amount of aerobic sludge in the system and effectively removes the biological nitrogen and phosphorus. The surplus active sludge is automatically removed from the BIOTAL plant. Phosphorus, accumulated with PP-bacteria in the aerobic zone, entering into oxygen-free conditions, passes into the dissolved state and is removed from the plant along with the surplus sludge. Due to the high age of active sludge (more than 25 days) and, consequently, its strong mineralization, as well as prolonged destabilization in the sludge capacity stabilizer, the dewatering of surplus sludge in the BIOTAL plant is carried out without the addition of flocculants. 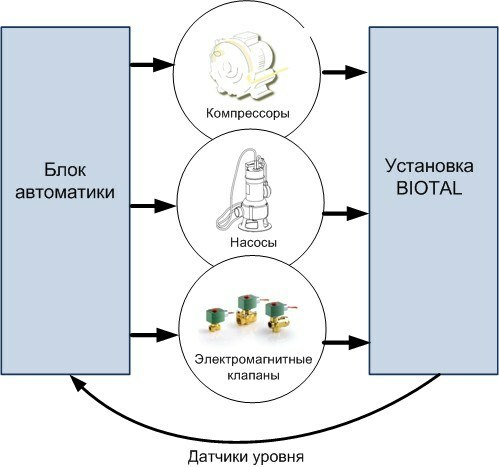 BIOTAL plant automatically switches to one of 5 modes of operation: forsage, normal and three economic modes (depending on the time of absence of sewage receipt to the plant: 1 hour, 1 day and 7 days). Such technical solution allows you to save up to 70% of electricity. In order to better understand the essence of BIOTAL technology, let’s consider the basic technological scheme of BIOTAL plant (see diagram) with capacity from 10 to 1200 m3/day. BIOTAL plant consists of a receiving chamber, the entrance to which is provided with the grid for detention of gross sewage, a three-stage reactor SBR, aerated circulating self-waster biological filter, contact reservoir and sludge capacity-aerobic stabilizer of surplus active sludge. The system operates on the principle of “divide and conquer”, since, according to well-known principles of biological wastewater treatment, the ideal cleaning is 7 consecutive aerotanks (literature data). In this case, in each aerotank, certain groups of microorganisms, that do not compete, are effectively working, since different groups of them effectively work in the narrow limits of the concentrations of contaminants that decrease during the purification, during the course of the sewage from the RC-D to the CR, that is water is processed step by step. Only in the BIOTAL plant a hydraulic connection between the RC-D and SBR reactor 1, between the 2nd and 3rd SBR reactors, between the 3rd reactor SBR and the biofilter-thin-layer tank, as well as between the biofilter-thin-layer tank and contact reservoir, is periodically interrupted by the program by disabling devices that provide this connection. The hydraulic connection is carried out between SB-1 and SBR-2 by feeding pumps, SBR-2 and SBR-3 by hydraulic flow or reverse airlifts, between SBR-3 and SB-1 – by a controlled siphon, a siphon airlift, or pumps, and, finally, between the BF-TLT and the CR – by hydraulic flow. In the course of the step-by-step transfer of treated wastewater from the zone to the zone, the purification takes place in stages 6-8 within one of the 5 programs, and, in economic modes, the composition of the phases is changed – the purified sewage is not pumped out and the surplus active sludge is not removed. BIOTAL system has three sludge systems: in RC-D, in 3-stage SBR and BF-TLT and is carried out by 4 contour recirculation of reverse active sludge – from SBR-2 to SBR-1, from SBR-3 to RC, from SBR-3 to SBR-1, from BF-TLT and from CR to RC. Such a construction of technology allowed to keep in the balance the trilymium system, as pumping wastewater in the process of cleaning from the RC to the SBR-1, from the SBR-3 to the BF-TLT and from the BF-TLT to the CR occurs after the cycles of defending respectively – in the RC, SBR- 3 and BF-TLT, with partial mixing of sludge of these structures in the process of recirculation before the settling cycles. 5 – in the contact reservoir the wastewater is treated, received on plant four cycles before. Cleaned wastewater during this process is gradually moved from the first to the last degree of purification of the LSTP, by periodic hydraulic coupling of these stages with the help of hydro-automatic devices or pumps. 8. Contact reservoir and two zones for surplus active sludge processing: aerobic stabilizer of surplus active sludge and dewatering machine. The sewage water, which is free of coarse impurities on an automated stepped grid, flows into a receiving chamber-denitrifier (RC-D) operating in SBR reactor mode as a receiver, receiving uneven discharges of wastewater and as a denitrifier of the first degree. In the receiving chamber-denitrifier there are: self-cleaning stainless steel grid with two-way bubbling for the detention and breaking of small sewage, aeration and mixing systems, self-cleaning level electrode sensors and feeding pumps into the 1st SBR reactor. Sewage, received in the receiving chamber-denitrifier, mixes with the reverse active sludge from the third reactor which contains nitrites and nitrates. In conditions of the mixing mode there is a process of denitrification with a double effect – denitrification with the separation of gaseous nitrogen and the oxidation of organic pollution of the waste water coming from the oxygen that is split off from nitrites in the process of denitrification. The RC-D automatically maintains the required concentration of active sludge by changing the height of the feeding pump of pre-cleaned in the RC sewage. This pump, pumping the sludge mixture into the SBR-1 after sedimentation of the RC-D, simultaneously pours surplus active sludge from RC-D to the level of pump suction. By raising or lowering the pump, you can adjust the required concentration of active sludge in RC-D. Pre-cleaned in RC-D sewage is pumped into the 1st SBR reactor. The SBR-1 reactor is hydraulically coupled to the P-1 overflow with the SBR-2 reactor. SBR-1 and SBR-2 cyclically carry out aeration and mixing with recirculation of the active mixture between them. The SBR-1 reactor has a second degree of denitrification in the mixing cycle. Since the SBR-2 undergoes a process of first-degree nitrification, and the reverse circulatory sludge from SBR-2 to the SBR-1 contains enough nitrites, and SBR-1 has a sufficient amount of easily oxidized organic matter. Denitrification can be carried out by deeper transferring of SBR-1 aerators to the mixing mode – partially closing the air that is fed to them. In this case, the second degree of denitrification will be carried out in the SBR-1 and during the aeration period in SBR-2, that is, practically throughout all purification cycles. After treating the sewage in the SBR-1 and SBR-2 reactors, they are pumped by controlled airlifts into the SBR-3 reactor, while they are blowing back into the SBR-2 foam, which protects the microorganisms of the active sludge of SBR-3 reactor from the adverse effects of saponates. 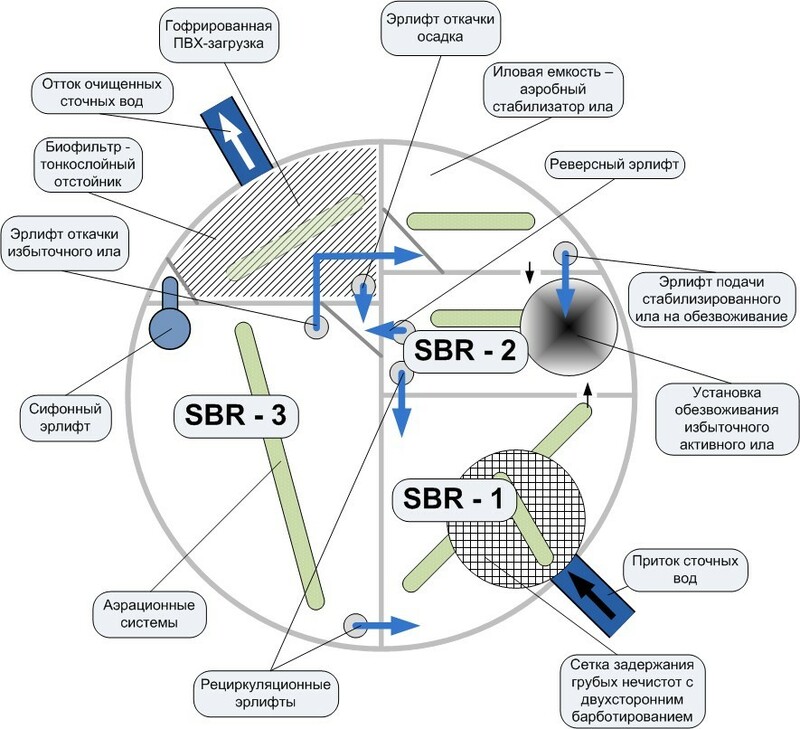 During operation of controlled airlifts that pump the sludge mixture from the second to the third SBR reactor, the reciprocal recycling of the active mixture from the 3rd reactor into the reactor SBR-1 and RC-D is carried out. 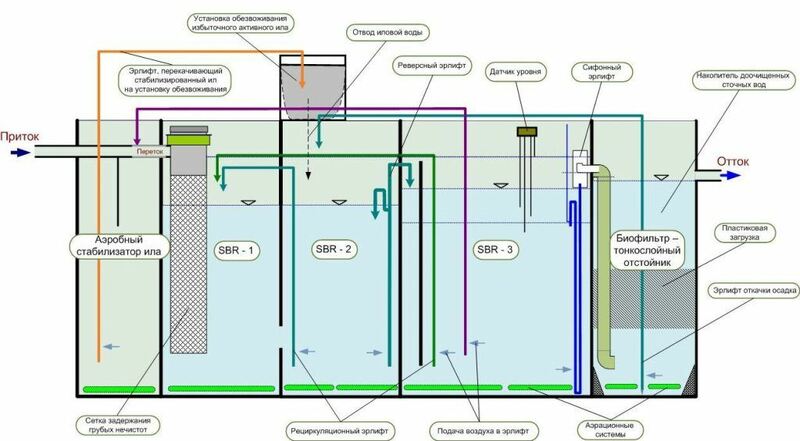 The SBR-3 reactor works initially as aerotank, where oxygen oxidation processes that are difficult to oxidize are carried out, and the second degree of nitrification, and then, after disconnecting of aerators and airlifts, begins to work as a secondary sedimentation tank. In the reactor SBR-3 consecutive aeration, prophylactics and subsequent discharge of controlled siphon of purified sewage into BF-TLT occur in succession, and pumping of surplus sludge into an aerobic stabilizer of surplus active sludge with subsequent delivery (after stabilization) to dewatering. In the aeration period of the SBR-3, the aeration of the central part of the loading of the BF-TLT occurs, thus creating an airlift effect in the cell loading, which leads to the recirculation of the wastewater discharged on the following principle: in those cells in which the air enters, occurs (due to the airlift effect) the movement of water up, and in those cells, loading of the BF-TLT, where air does not get, the water moves from the top to the bottom. The plastic loading of BF-TLT is covered with a biofilm, only that part of which the air enters, works on oxidation (oxidation of hard-organically produced organic matter and nitrification of the 3rd degree), and cells of plastic loading of the BF-TLT, where the air does not enter, – act as denitrifier of the 3rd degree. The purified sewage from the third SBR reactor is discharged into the lower part of the BF-TLT, after stopping the aeration of the BF-TLT, settling and pumping out surplus sludge from the BF-TLT. The purified sewage, moving from the bottom to the top in the BF-TLT, displaces the treated waste water from the BF-TLT in the CR through the cells of plastic loading, which in this case starts to work not as a plastic loading of the BF, but as a thin-layer sedimentation tank. This ensures the effect of suspending suspended substances in 5 times higher than in the classical defense (literature data and real experience). In turn, extracted wastewater in the BF-TLT floods through the hydraulic flow to the lower part of the CR to disinfect it, from which the outflow of cleaned and disinfected waste water is displaced from the plant. – emergency switching on of the sewage feeding pump, etc. All parameters of the BIOTAL plant operation can be viewed and, if necessary, changed by logging in to the controller program. Since the composition of sewage and the dynamics of their inflow to different WTP are very different, service team can adjust its work to optimize the operation of the plant, taking into account the specifics of object. You can also control and modify the parameters of the plant in case of an emergency from the dispatch service via modem connection. Standard programs of BIOTAL plants are designed for domestic waste water, therefore there is no need to change them, it may be necessary to adjust the operation of the plant when cleaning mixed domestic and industrial sewage, as well as at volley discharges of sewage, in excess above the designed. BIOTAL technology for plants with capacity from 1,5 to 6,0 m3/day, which is located in one cylindrical case, is solved more easily, although it solves the main technological problems. This is a 7-step, 2-sludge system, with 3 contour recirculation of reverse active sludge, operating in one of 6 programs, which are automatically switched depending on the number of waste water, entering to it. The technology scheme of BIOTAL plants from 1,5 to 10 m3 per day.